According to a leaked document, Samsung intends to update its top US devices to Marshmallow starting in December, finishing off updates in February of next year. 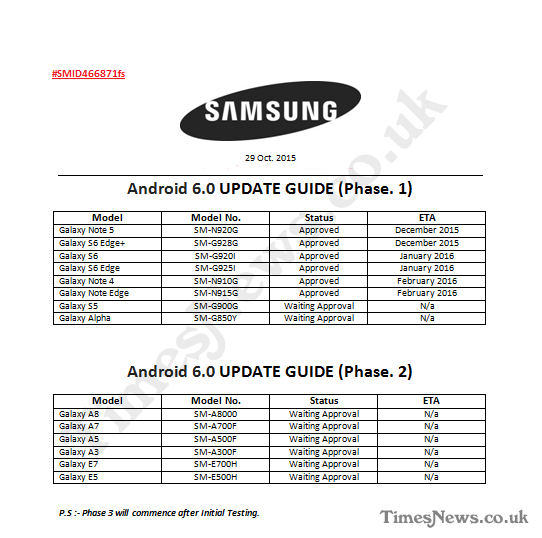 From what the document claims, the Galaxy Note 5 and Galaxy S6 Edge+ will be the first to receive Marshmallow in December, with the Galaxy S6 and Galaxy S6 Edge set to receive Android 6.0 in January. Typically, Samsung is pretty bad at communicating update availability, given their smartphones are deployed across the globe on hundreds of carriers. This makes pinpointing exact update times rather difficult. However, for us in the US, rest assured that Marshmallow will indeed come sooner or later. Samsung owners, are you ready for Marshmallow?